Hearthstone Recap: Curse of Naxxramas Release Date, New Card + More! hearthstone Hearthstone Recap: Curse of Naxxramas Release Date, New Card + More! Curse of Naxxramas release date, new card and more! It's been an exciting week in Hearthstone with the very welcome news of Curse of Naxxramas release date! The Adventure will release in the Americas region on all available platforms on July 22 (July 23 in Europe)! The Arachnid Quarter will be available for free for the first month after release, so even if you don't have much time to play, be sure to log in and get your free wing! We've outlined the full pricing structure in our Curse of Naxxramas Adventure Preview. Blizzard has also previewed an upcoming Curse of Naxxramas Legendary card, the fearsome final boss of the Plague Quarter, Loatheb! Check out the new card, Curse of Naxxramas release information, current Ranked Play standings and even find out what Hearthstone card you are in this week's Hearthstone recap! Curse of Naxxramas will (finally) go live in the Americas region for Windows®, Mac®, and iPad® on Tuesday, July 22! European release will follow on July 23. The Arachnid Quarter will be offered at launch (for free), so everyone will have the opportunity to immediately start playing the Adventure! Blizzard has stated that the Arachnid Quarter promotion will last for "roughly a month," after which any players who have not unlocked it during the event will have to purchase the wing with in-game gold or real money. Blizzard has posted a detailed blog explaining the process for unlocking the wings, and we have updated our Curse of Naxxramas Adventure Preview will all available information! We can't wait! This week on Twitter, Blizzard has revealed another new Curse of Naxxramas card on the Hearthstone Twitter! 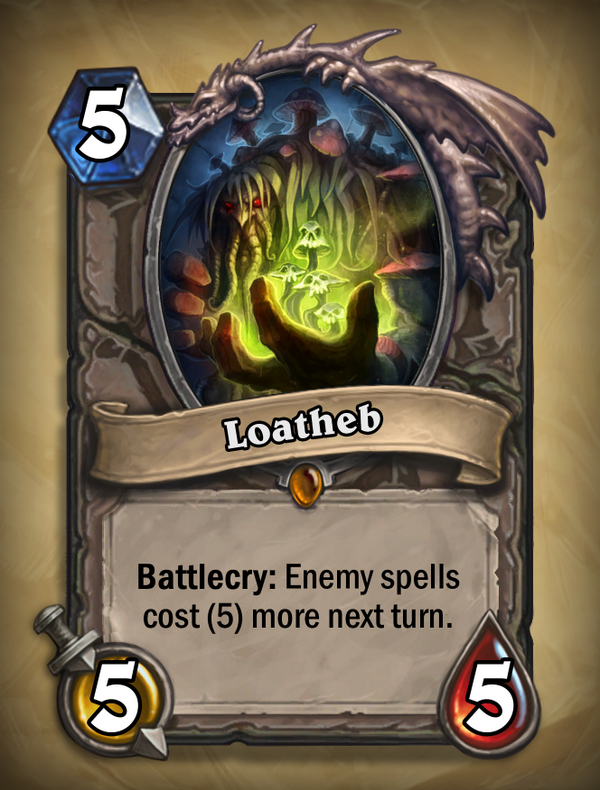 This week's card is Loatheb, a legendary minion (I'm sure he doesn't like being called that) with a crazy powerful Battlecry ability! 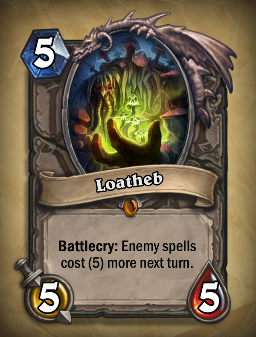 Loatheb is the final boss of the Plague Quarter of Naxxramas. You can find out more about the upcoming Adventure in our Curse of Naxxramas Adventure Preview! Which Hearthstone Card Are You? In the light-hearted spirit of ridiculous online quizzes, Blizzard has released an official "What Hearthstone Card Are You?" Innkeeper's Quiz available on the Hearthstone Facebook page. The quiz asks 10 fun questions and (like any Facebook quiz) you can share your result with all of your friends! You can also take the quiz online at HearthstoneQuiz.com (but you will still be asked to login with Facebook). Ranked Play Season 4 comes to an end soon, and (as usual) Blizzard has provided a list of the current top players! Players who reach at least Rank 20 this season will be rewarded with the awesome Naxxramas card back! Remember, the top 16 Legend players of each season will qualify for participation in the Hearthstone Americas Qualifier Tournament for their chance at representing the Americas in the Hearthstone World Championships! The data below is up-to-date as of July 16, 2014. See our top ranked players in the European region here. Blizzard has updated their list of players who have already qualified to participate in the World Championship Qualifier event! These players have qualified with their expert performance in Ranked Play Seasons, with a handful of players having earned seeds through qualifying community tournament events! Interested in earning a spot in the qualifiers? Players can check out an updated list of eligible community tournaments on the Hearthstone website! In case you missed it, this past weekend's Intel Extreme Masters Shenzhen event was host to some insane Hearthstone action! You can find all of the match videos from this event on YouTube in ESL's Hearthstone playlist! Be aware that due to the file naming structures, there will be match spoilers, so if you'd prefer a spoiler-free viewing experience, you can check out the links at the bottom of this Hearthpwn post!